Home Xây dựng How are bricks made? The term brick refers to small units of building material, often made from fired clay and secured with mortar, a bonding agent comprising of cement, sand, and water. Long a popular material, brick retains heat, withstands corrosion, and resists fire. Because each unit is small—usually four inches wide and twice as long, brick is an ideal material for structures in confined spaces, as well as for curved designs. Moreover, with minimal upkeep, brick buildings generally last a long time. For the above-cited practical reasons and because it is also an aesthetically pleasing medium, brick has been used as a building material for at least 5,000 years. The first brick was probably made in the Middle East, between the Tigris and Euphrates rivers in what is now Iraq. Lacking the stone their contemporaries in other regions used for permanent structures, early builders here relied on the abundant natural materials to make their sun-baked bricks. These, however, were of limited use because they lacked durability and could not be used outdoors; exposure to the elements caused them to disintegrate. The Babylonians, who later dominated Mesopotamia, were the first to fire bricks, from which many of their tower-temples were constructed. From the Middle East the art of brickmaking spread west to what is now Egypt and east to Persia and India. Although the Greeks, having a plentiful supply of stone, did not use much brick, evidence of brick kilns and structures remains throughout the Roman Empire. However, with the decline and fall of Rome, brickmaking in Europe soon diminished. It did not resume until the 1200s, when the Dutch made bricks that they seem to have exported to England. In the Americas, people began to use brick during the sixteenth century. It was the Dutch, however, who were considered expert craftsmen. Prior to the mid-1800s, people made bricks in small batches, relying on relatively inefficient firing methods. One of the most widely used was an open clamp, in which bricks were placed on a fire beneath a layer of dirt and used bricks. As the fire died down over the course of several weeks, the bricks fired. Such methods gradually became obsolete after 1865, when the Hoffmann kiln was invented in Germany. Better suited to the manufacture of large numbers of bricks, this kiln contained a series of compartments through which stacked bricks were transferred for pre-heating, burning, and cooling. Brickmaking improvements have continued into the twentieth century. 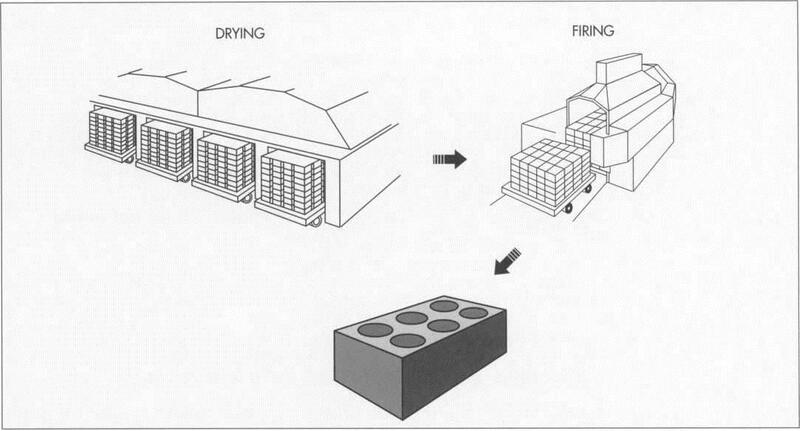 Improvements include rendering brick shape absolutely uniform, lessening weight, and speeding up the firing process. For example, modem bricks are seldom solid. Some are pressed into shape, which leaves a frog, or depression, on their top surface. Others are extruded with holes that will later expedite the firing process by exposing a larger amount of surface area to heat. Both techniques lessen weight without reducing strength. However, while the production process has definitely improved, the market for brick has not. Brick does have the largest share of the opaque materials market for commercial building, and it continues to be used as a siding material in the housing industry. However, other siding materials such as wood, stucco, aluminum, plaster, and vinyl are strong competitors because they cost up to 50 percent less, and some (notably stucco and plaster) offer built-in insulation. Yet these systems can cost up to 1.75 times that of brick, which also requires less maintenance. Other materials that compete with brick despite their usually higher cost include precast concrete panels, glass, stone, artificial stone, concrete masonry, and combinations of these materials, because advances in manufacturing and design have made such materials more attractive to the builder. According to the U.S. Industrial Outlook, the use of brick as a siding material for single family homes dropped from 26 percent in 1984 to 17 percent in 1989. Natural clay minerals, including kaolin and shale, make up the main body of brick. Small amounts of manganese, barium, and other additives are blended with the clay to produce different shades, and barium carbonate is used to improve brick’s chemical resistance to the elements. Many other additives have been used in brick, including byproducts from papermaking, ammonium com-pounds, wetting agents, flocculents (which cause particles to form loose clusters) and deflocculents (which disperse such clusters). Some clays require the addition of sand or grog (pre-ground, pre-fired material such as scrap brick). A wide variety of coating materials and methods are used to produce brick of a certain color or surface texture. To create a typical coating, sand (the main component) is mechanically mixed with some type of colorant. Sometimes a flux or frit (a glass containing colorants) is added to produce surface textures. The flux lowers the melting temperature of the sand so it can bond to the brick surface. Other materials including graded fired and unfired brick, nepheline syenite, and graded aggregate can be used as well. The initial step in producing brick is crushing and grinding the raw materials in a separator and a jaw crusher. Next, the blend of ingredients desired for each particular batch is selected and filtered before being sent on to one of three brick shaping processes—extrusion, molding, or pressing, the first of which is the most adaptable and thus the most common. Once the bricks are formed and any subsequent procedures performed, they are dried to remove excess moisture that might otherwise cause cracking during the ensuing firing process. Next, they are fired in ovens and then cooled. Finally, they are dehacked—automatically stacked, wrapped with steel bands, and padded with plastic comer protectors. 1 First, each of the ingredients is conveyed to a separator that removes oversize material. A jaw crusher with horizontal steel plates then squeezes the particles, rendering them still smaller. After the raw materials for each batch of bricks have been selected, a scalping screen is often used to separate the different sizes of material. Material of the correct size is sent to storage silos, and over¬sized material goes to a hammermill, which pulverizes it with rapidly moving steel ham¬mers. The hammermill uses another screen to control the maximum size of particle leav¬ing the mill, and discharge goes to a number of vibrating screens that separate out material of improper size before it is sent on to the next phase of production. 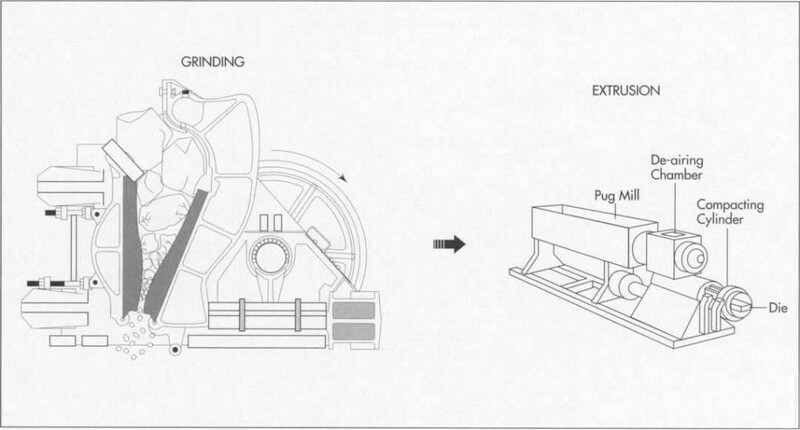 2 With extrusion, the most common method of brick forming, pulverized material and water are fed into one end of a pug mill, which uses knives on a rotating shaft to cut through and fold together material in a shallow chamber. The blend is then fed into an extruder at the far end of the mill. The extruder usually consists of two chambers. The first removes air from the ground clay with a vacuum, thereby preventing cracking and other defects. The second chamber, a high-pressure cylinder, compacts the material so the auger can extrude it through the die. After it is compressed, the plastic material is forced out of the chamber though a specially shaped die orifice. The cross-section of the extruded column, called the “pug,” is formed into the shape of the die. Sections of desired length are cut to size with rotating knives or stiff wires. In molding, soft, wet clay is shaped in a mold, usually a wooden box. The interior of the box is often coated with sand, which provides the desired texture and facilitates removing the formed brick from the mold. Water can also be used to assist release. Pressing, the third type of brick forming, requires a material with low water content. The material is placed in a die and then compacted with a steel plunger set at a desired pressure. More regular in shape and sharper in outline than brick made with the other two methods, pressed bricks also feature frogs. 3 Chamfering machines were developed to produce a furrow in brick for such applications as paving. These machines use rollers to indent the brick as it is being extruded. They are sometimes equipped with wire cutters to do the chamfering and cutting in one step. Such machines can produce as many as 20,000 units per hour. 4 The choice of sand coating, also applied as the brick is extruded, depends on how soft or hard the extruded material is. A continuous, vibrating feeder is used to coat soft material, whereas for textured material the coating may have to be brushed or rolled on. For harder materials a pressure roller or compressed air is used, and, for extremely hard materials, sand blasting is required. 5 Before the brick is fired, it must be dried to remove excess moisture. If this moisture is not removed, the water will bum off too quickly during firing, causing cracking. Two types of dryers are used. Tunnel dryers use cars to move the brick through humidity- controlled zones that prevent cracking. They consist of a long chamber through which the ware is slowly pushed. External sources of fan-circulated hot air are forced into the dryer to speed the process. 6 Automatic chamber dryers are also used, especially in Europe. The extruded bricks are automatically placed in rows on two parallel bars. The bricks are then fed onto special racks with finger-like devices that hold several pairs of bars in multiple layers. These racks are then transferred by rail- mounted transfer cars or by lift trucks into the dryers. 7 After drying, the brick is loaded onto cars (usually automatically) and fired to high temperatures in furnaces called kilns. In general, the cars that moved the bricks through the drying process are also used to convey them through the tunnel kiln. These cars are pushed through the kiln’s continuously maintained temperature zones at a specific rate that depends on the material. The majority of kilns in the United States use gas as a fuel source, though a third of the brick currently produced is fired using solid fuels such as sawdust and coal. Tunnel kilns have changed in design from high-load, narrow- width kilns to shorter, lower-set wider kilns that can fire more brick. This type of design has also led to high-velocity, long-flame, and low-temperature flame burners, which have improved temperature uniformity and lowered fuel consumption. 8After the brick is fired and cooled, it is unloaded from the kiln car via the dehacking process, which has been automated to the point where almost all manual brick handling is eliminated. Automated setting machines have been developed that can set brick at rates of over 18,000 per hour and can rotate the brick 180 degrees. Usually set in rows eleven bricks wide, a stack is wrapped with steel bands and fitted with plastic strips that serve as comer protectors. The packaged brick is then shipped to the job site, where it is typically unloaded using boom trucks. Though the brick industry is often considered unsophisticated, many manufacturers are participating in total quality management and statistical control programs. The latter involves establishing control limits for a certain process (such as temperature during drying or firing) and tracking the parameter to make sure the relevant processes are kept within the limits. Therefore, the process can be controlled as it happens, preventing defects and improving yields. A variety of physical and mechanical properties must be measured and must comply with standards set by the American Society of Testing and Materials (ASTM). These properties include physical dimensions, density, and mechanical strength. Another important property is freeze-thaw durability, where the brick is tested under conditions that are supposed to simulate what is encountered in the outdoors. However, current tests are inadequate and do not really correlate to actual conditions. What passes in the laboratory may not pass in the field. Therefore, the brick industry is trying to develop a more accurate test. A similar problem exists with a condition known as efflorescence, which occurs when water dissolves certain elements (salt is among the most common) in exterior sources, mortar, or the brick itself. The residual deposits of soluble material produce surface discoloration that can be worsened by improper cleaning. When salt deposits become insoluble, the efflorescence worsens, requiring extensive cleaning. Though a brick may pass the laboratory test, it could fail in the field due to improper design or building practices. Therefore, brick companies are developing their own in-house testing procedures, and research is continuing to develop a more reliable standard test. Currently, the use of brick has remained steady, at around seven to nine billion a year, down from the 15 billion used annually during the early 1900s. In an effort to increase demand, the brick industry continues to explore alternative markets and to improve quality and productivity. Fuel efficiency has also improved, and by the year 2025 brick manufacturers may even be firing their brick with solar energy. However, such changes in technology will occur only if there is still a demand for brick. some plants have already installed such systems, the U.S. brick industry is trying to play a more important role in developing less expensive emissions testing methods and establishing emission limits. If the brick industry cannot persuade federal regulators to lower their requirements, it is quite possible that the industry could shrink in size, as some companies cannot afford to comply and will go out of business. Bender, Willi and Frank Handle. Brick and Tile Making. Bauverlag GmbH, 1985. Jones, J. T. and M. F. Berard. Ceramics: Industrial Processing and Testing. Iowa State University Press, 1972. Robinson, Gilbert C. Ceramics and Glasses. ASM International, 1992, pp. 943-950. “Trends in Brick Plant Operations,” The American Ceramic Society Bulletin. 1992, pp. 69-74. Hall, Alvin. “Using Computer-Aided Man-ufacturing to Build Better Brick,” The Amer¬ican Ceramic Society Bulletin. 1990, pp. 80-82. Richards, Robert W. “Brick Manufacturing from Past to Present,” The American Ceramic Society Bulletin. May, 1990, pp. 807-813. Sheppard, Laurel M. “Making Brick and Meeting Regulations,” The American Ceramic Society Bulletin. 1993. “Lodge Lane Brickworks: A Breakthrough in the Reduction Firing of Bricks,” Ziegelindustrie. September, 1992, pp. 344¬341.